6540 Series seating from HON blends 18th century style and modern ergonomics. Four-leg guest chair features nailhead trim on upholstered fixed arms and scrolled hardwood accents. Its high recycled content reduces wood waste. Upholstery color on seat and back is Merlot, and wood finish color is Mahogany. Seat measures 20" wide x 18-1/2" deep and is 19" from the floor. Distance between arms is 18-1/2", and the usable seat depth is 18-1/2". Back dimensions are 22-1/2" wide x 21" high. 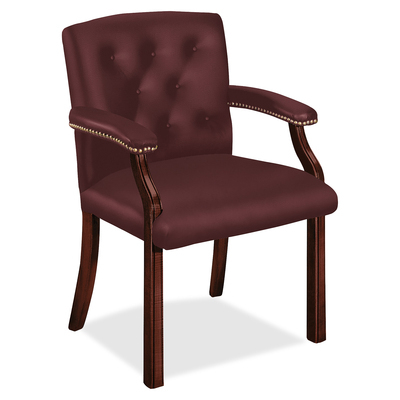 Guest chair is designed to complement the HON 6540 Executive High-back Chair. Chair meets or exceeds ANSI/BIFMA and ISTA performance standards.